Yes, the math was right. 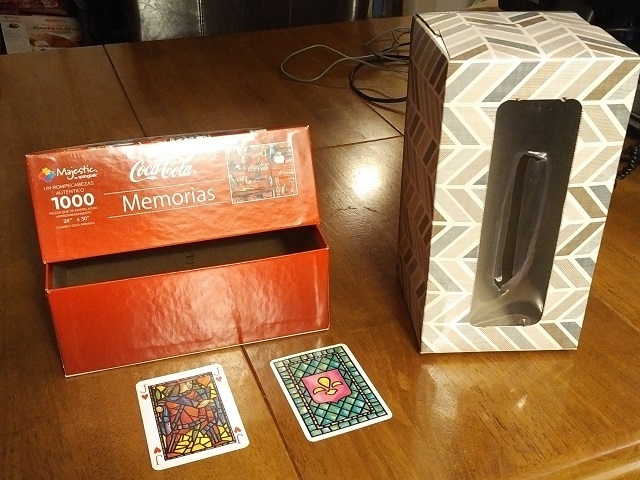 This scratchbuild project was predicated on the first pollen of the season making me empty a tissue box in three days and the cat chewing up some cards from a nice decorative set. All I can say is pray for more pollen and give those cats a scratch behind the ears. I'm in awe of projects like this – and the skill of those who make them. HQ for the cult of Pollonic Infusion. Led by the infamous Felis Chewus Rampagius. When you paint the tissue box do you have a problem with warping? Not usually. The outside of the box has a satin sealed finish, so it takes paint and doesn't warp. It also helps that I don't break the structure of the box the way it was glued and sealed by the machine. If you paint the inside, which is unsealed, it will tend to warp unless you paint the outside at roughly the same time. etotheipi, I almost forgot, fiendishly clever as usual.